BILL MOYERS JOURNAL brings television viewers a deeply moving and intimate performance by award-winning actor Sam Waterston and eminent historian Harold Holzer. Lincoln's Legend and Legacy features the spoken poetry and prose of American writers as different as Walt Whitman, Frederick Douglass, Allen Ginsburg, Langston Hughes, Harriet Beecher Stowe, and many others who have struggled to find words that adequately describe this tall, plain and gangling man and the transcendent significance of his presidency. Responding to the arc of ideas, language and history included in excerpts of their writings, Bill Moyers says, "Lincoln changes as we hear these words, and so does the country." 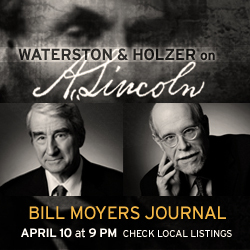 This special performance edition of BILL MOYERS JOURNAL will be broadcast on PBS at 9 p.m. on April 10th, which is also Good Friday, the tragic day on which Lincoln was shot just as the Civil War was coming to a close. Lincoln's martyrdom catapulted him from president to icon, from mortal man to enduring myth, and each American generation has subsequently approached his towering legend through the prism of its own perceptions. While writers over 150 years have compared him to Washington, Jesus, and Moses, other more critical contrasting voices have cast him as Hamlet, too slow to pick up the mantle of Emancipator. Interpreting his political legacy for their own contemporary purposes, Republicans and Democrats, blacks and whites have shaped an evolving portrait of Lincoln that adds nuance and dimension to the marble hero. 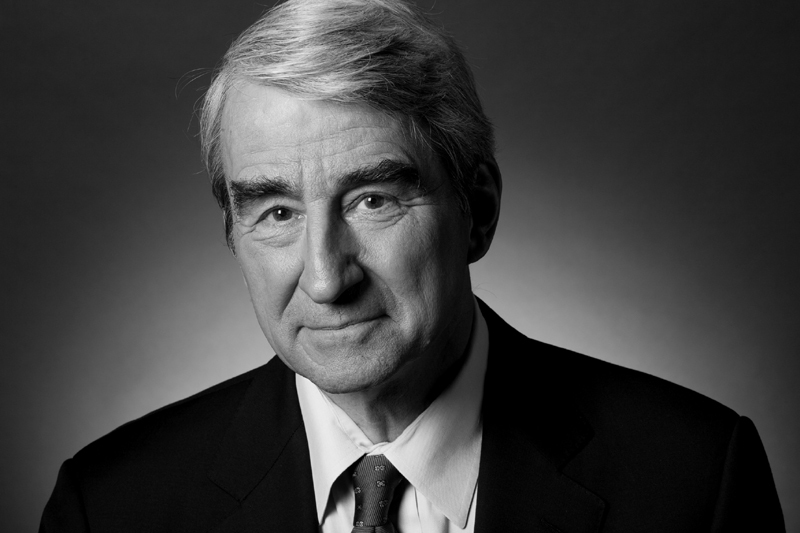 Well-known as the star of television's LAW & ORDER, Sam Waterston has inhabited the role of Lincoln on many stages and is a self-made scholar of the 16th president. 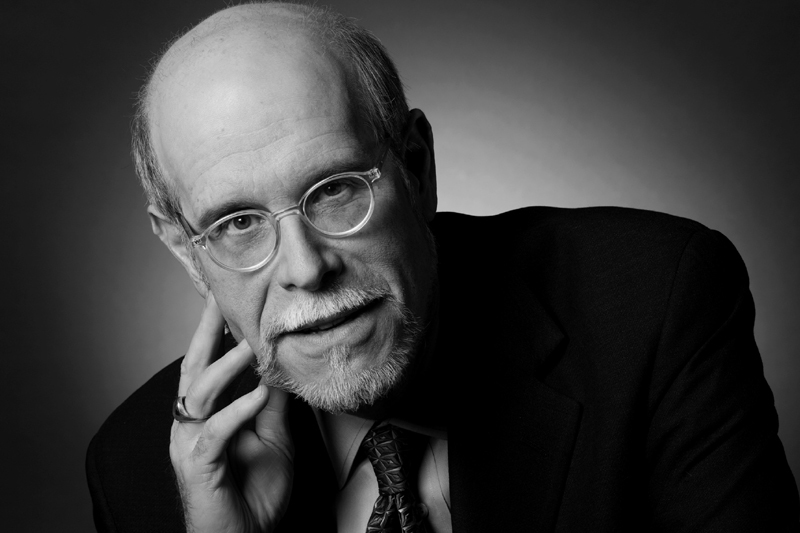 Harold Holzer, a prolific author on the subject of Lincoln, is co-chairman of the U.S. Lincoln Bicentennial Commission underway this year and recently edited THE LINCOLN ANTHOLOGY: GREAT WRITERS ON HIS LIFE AND LEGACY FROM 1860 TO NOW, published by the Library of America. This anthology is the source for excerpts included in this performance, from first hand observations by Lincoln's contemporaries to the words of Barack Obama, the most recent American president to lay claim to Lincoln's legacy. Funders for Bill Moyers Journal include: the Partridge Foundation, a John and Polly Guth Charitable Fund; Park Foundation; The Kohlberg Foundation; The Herb Alpert Foundation; the Marilyn and Bob Clements and The Clements Foundation; Bernard and Audre Rapoport and The Bernard and Audre Rapoport Foundation; the Fetzer Institute; The John D. and Catherine T. MacArthur Foundation; the Orfalea Family Foundation; and the Public Welfare Foundation, and our sole corporate sponsor Mutual of America Life Insurance Company. Bill Moyers Journal is a production of Public Affairs Television, Inc. and a national presentation of Thirteen/WNET New York. Historian Harold Holzer explains Herman Melville observed the morning crepe strung for black Easter and viewed Lincoln as not just a second Washington, but a second messiah. Here Sam Waterston reads Melville's elegiac poem. 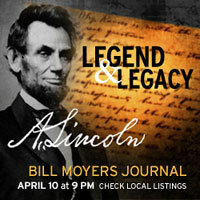 Lincoln's Legend and Legacy - A special edition of Bill Moyers Journal premiering April 10, 2009 at 9PM on PBS. (check local listings). All you have to do is copy the following code and paste it on your website. According to historian Harold Holzer, Allen Ginsberg saw Lincoln through a radical lens as a rallying cry for revolutionary change in this homage to Neruda read by Sam Waterston. Lincoln's Legend and Legacy - A special edition of Bill Moyers Journal premiering April 10, 2009 at 9PM on PBS (check local listings). 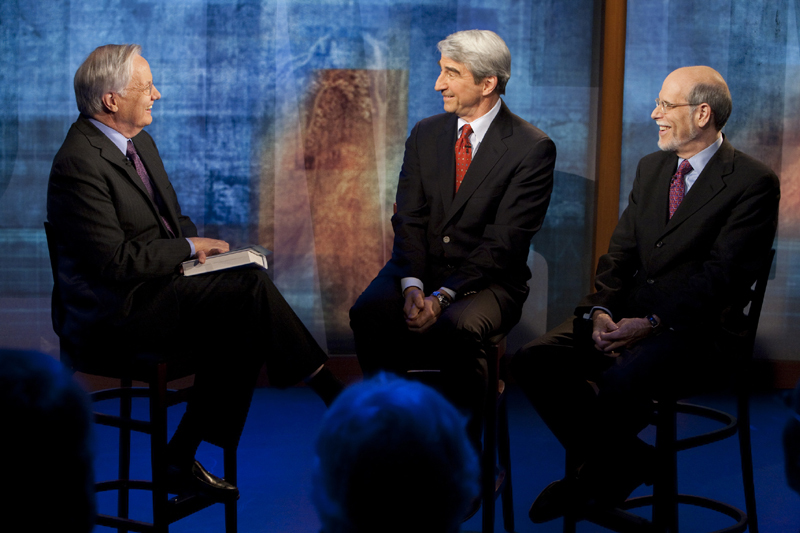 Left to right: Sam Waterston, Harold Holzer, Waterston, Holzer and Bill Moyers on set. All photos copyright Robin Holland. Copy the code following the banner you choose and paste it on your website.